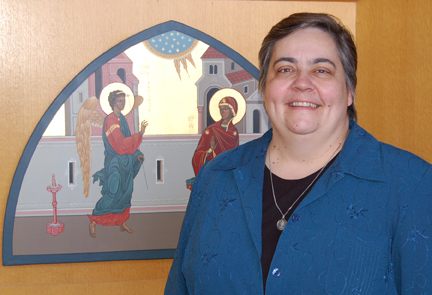 Following a weekend of prayer and discernment, the Benedictine Sisters of Annunciation Monastery, Bismarck, re-elected Sister Nancy Miller, OSB, as prioress on March 10, 2012. Sister Nancy was initially installed as prioress on May 16, 2008. Prioress election is held every four years in Benedictine monastic communities, with a 12-year limit. Born and raised in Harvey, ND, to Joyce and Paul Miller, Sister Nancy is the fifth of eight children. She first became acquainted with the Sisters of Annunciation Monastery while attending the University of Mary where she received her undergraduate degree in business administration and a master’s degree in management. The prioress is the spiritual and administrative leader of the religious community. Prayerful discernment and study takes place every four years as the sisters develop their long range plan outlining directives to enhance mission, ministry and promote vocations to religious life. “It is critical that we collaborate with others and respond to the needs of the times as our founding sisters responded – guided by the Holy Spirit with vision, faith and courage,” says Sister Nancy.